Tom Brady wore an Under Armour shirt after agreeing to become a spokesman for the firm. Tom Brady has seen the future, and it’s Ben Lukas, an unassuming 11-year-old from Newton. “I feel like I’d throw better if I was wearing what Tom Brady wears,’’ said Lukas, who was shopping at Modell’s Sporting Goods in Newton with his mother a day after it was announced that Brady is ditching Nike and moving to Under Armour, an athletic wear company 1/20th the size of Nike. In corporate speak, Brady’s move to Under Armour, announced last week, is a win-win. The deal gives the 33-year-old quarterback not only a multiyear endorsement contract but an undisclosed stake in the company, which can provide revenue after he stops playing. For its part, Under Armour has nabbed an international sports and style icon. The company is banking that the NFL’s biggest celebrity will build awareness of the brand and help propel Under Armour from a small, second-tier firm to a major player. Under Armour may not be a household name, but it has cachet among teens and preteens, weekend athletes, and Hollywood stars. The 14-year-old Baltimore company was founded by a college football player who got tired of changing his wet, heavy T-shirt during games. At first, Under Armour’s only product was a compression T-shirt to be worn as a base layer. Since then, it has evolved to include all manner of athletic wear, as well as pricey women’s jackets, hats for girls, and sunglasses. Under Armour may be an up-and-coming brand — its net income was $34.9 million in the third quarter, compared with $26.2 million in the prior year’s period — but it pales in comparison with Nike, whose income for its most recent quarter was many times greater at $559 million. People say they like Under Armour’s high-performance fabrics for summer and winter that can wick sweat or lock in heat. At the same time, the clothing is stylish: The attractive interlocking “U’’ and “A’’ logo says, “I’m ahead of the swoosh.’’ The company says its clothing has been worn by such luminaries as Kim Kardashian, Jennifer Aniston, and Halle Berry. 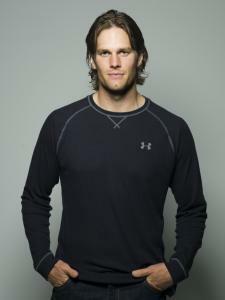 Brady has said he hopes his association with Under Armour will help him remain hip to a younger generation. “It’s what so many of the kids are wearing, and I like to try to stay cutting-edge,’’ he told Sports Illustrated after a photo shoot in Boston. A call to Brady’s agent on the deal went unreturned. “The key is youth: the 11-, 12-, 13-year-olds,’’ company founder and chief executive Kevin Plank told SI. If Under Armour’s strategy in tapping Brady is sound, soon you will be able to look for its clothes on a child near you — or be prepared to fend off begging. “It’s really expensive,’’ said Lukas’s mother, Sarah, who was trying to limit her son’s wardrobe expectations on their recent shopping trip. True, Under Armour’s hooded sweatshirts for children go for $49.99, and shorts retail at $24.99, but who can blame Ben Lukas? Brady is a sports star icon. That is in part why style observers, sports marketing executives, and commentators were worked up by Brady’s move from a corporate giant to a much smaller company, after his contract with Nike expired this summer. Brady will appear in advertising and promotional campaigns, and wear Under Armour apparel and footwear for training. He’ll debut a customized Under Armour Fierce cleat in games in the near future. Sutton, of the University of Central Florida, said Brady’s endorsement could help the brand appeal to women. “Tom Brady’s a really good-looking guy, real popular with the women, and UA is really pushing their women’s fitness gear.’’ Earlier this fall, Under Armour introduced a Facebook page aimed at women. Beth Teitell can be reached at bteitell@globe.com.